Home / Events / The 2014 John Howes Lecture in Japanese Studies – Full Lecture Now Online! The 2014 John Howes Lecture in Japanese Studies – Full Lecture Now Online! What does it mean to translate and how can it be done? And how can we as contemporary readers understand the writings of poets of the distant past from distant cultures? 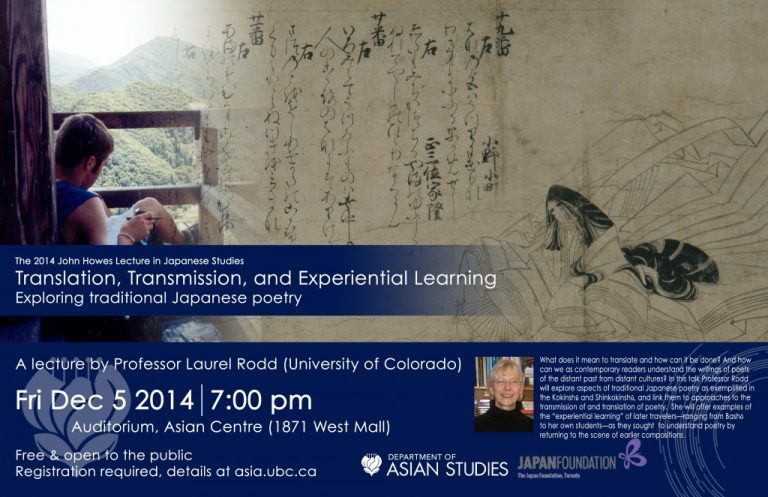 In this talk, Professor Rodd will explore aspects of traditional Japanese poetry as exemplified in the Kokinshū and Shinkokinshū, and link them to approaches to the transmission of and translation of poetry. She will offer examples of the “experiential learning” of later travelers—ranging from Bashō to her own students—as they sought to understand poetry by returning to the scene of earlier compositions.